The use of social sterotypes as a basis for judgments and behavioral decisions has been a major focus of social psychological theory and research since the field began. Although motivational and cognitive influences on stereotyping have been considered, these two general types of influence have rarely been conceptually integrated within a common theoretical framework. Nevertheless, almost every area of theoretical and empirical concern in social cognition--areas such as the interpretation of new information, memory and retrieval processes, impression formation, the use of heuristic vs. analytic processing strategies, the role of affect in information processing, and self-esteem maintenance--has implications for this important social phenomenon. *the social judgments and behavioral decisions that are ultimately made. The stereotype activation and suppression mechanisms that the target article authors consider operate at all of these stages. Their conceptualization provides a framework within which the interrelatedness of processing at these stages can be understood. * the conceptualization of stereotypes themselves. Contents: Preface. G.V. Bodenhausen, C.N. 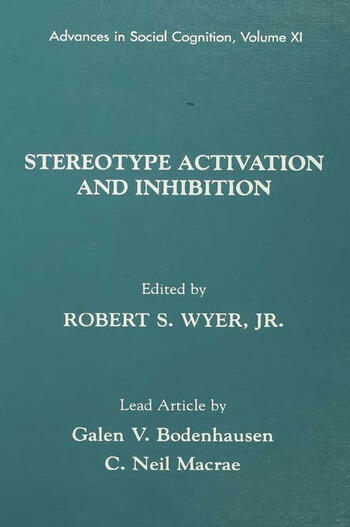 Macrae, Stereotype Activation and Inhibition. D. Abrams, B. Masser, Context and the Social Self-Regulation of Stereotyping: Perception, Judgment, and Behavior. P.G. Devine, Beyond the Isolated Social Perceiver: Why Inhibit Stereotypes? A. Dijksterhuis, A. van Knippenberg, Inhibition, Aberdeen, and Other Cloudy Subjects. R.H. Fazio, Further Evidence Regarding the Multiple Category Problem: The Roles of Attitude Accessibility and Hierarchical Control. D. Kobrynowicz, M. Biernat, Considering Correctness, Contrast, and Categorization in Stereotyping Phenomena. A.J. Lambert, A.L. Chasteen, S. Khan, J. Manier, Rethinking Some Assumptions About Stereotype Inhibition: Do We Need to Correct Our Theories About Correction? A. Liberman, L.S. Newman, S. Chaiken, Rethinking the Role of Facilitation and Inhibition in Stereotyping. D. Operario, S.A. Goodwin, S.T. Fiske, Power Is Everywhere: Social Control and Personal Control Both Operate at Stereotype Activation, Interpretation, and Response. L.D. Reid, R.S. Wyer, Jr., Stereotype Suppression in a Social Context. C. Stangor, E.P. Thompson, T.E. Ford, An Inhibited Model of Stereotype Inhibition. S.J. Stroessner, Varieties of Inhibition in Social Stereotyping. N.A. Wyer, D.L. Hamilton, The Balance Between Excitation and Inhibition in Stereotype Use. G.V. Bodenhausen, C.N. Macrae, On Social Judgment and Social Justice: Further Reflections on Stereotyping and Its Avoidance. "...the Bodenhausen-Macrae model provides a much-needed framework for our thinking about stereotypes. It shapens important questions and will facilitate useful debate and research about the nature of stereotype facilitation and inhibition. It is a worthy continuation of this influential series of books edited by Robert Wyer, and provides a good introduction to those who want a peek into the complex world of how we use our stereotypes and what happens when we try to suppress them."